Some of the famous cherry blossoms around Washington, D.C.'s Tidal Basin suffered "widespread damage" because of bitterly cold weather this week and they are still at risk, the National Park Service says. Low overnight temperatures damaged many blossoms that had reached the "puffy white" stage of blooming, which is the fifth of six stages in the bloom cycle. About half of the trees around the Tidal Basin were in the puffy white stage when temperatures dropped. "The number of cherry trees that reach the blossom stage may be reduced as a result of the recent cold temperatures," the park service said in an announcement Wednesday morning. 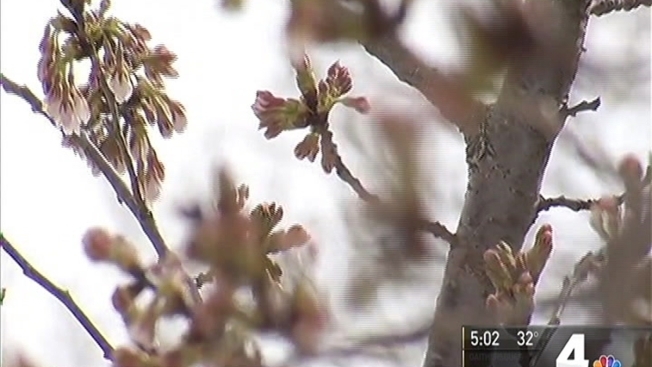 This is the first time in the trees' 105-year history that they will not reach peak bloom. Washington's famous cherry blossoms are encased in ice after snowfall late Monday and early Tuesday -- but Wednesday's low temperatures will be more dangerous for the blooms. 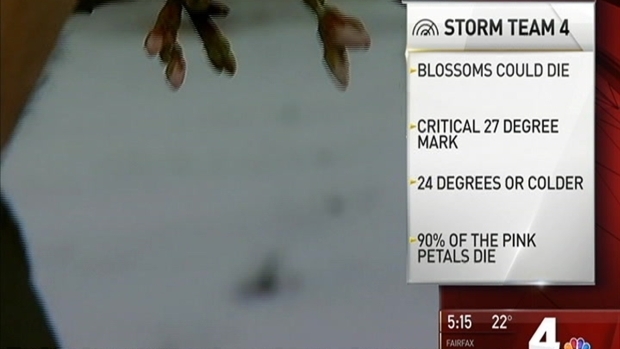 Temperatures below 27 degrees kill about 10 percent of the blossoms, as News4 previously reported. At 24 degrees or lower, about 90 percent of the pink petals die. The temperature early Wednesday dropped below the critical 24 degree mark, and temperatures are expected to be in the low 20s for the next two nights. The cherry blossoms were strikingly encased in ice after snowfall late Monday and early Tuesday. UpdatedHow Much Snow Did Your Neighborhood Get? The National Cherry Blossom Festival is still on, but the opening date of the welcome area and ANA Performance Stage has been pushed back from Wednesday to Saturday, organizers announced Tuesday morning. Organizers cited "setup delays caused by the storm." Peak bloom of the Yoshino variety of the trees still is expected to occur between Sunday and Wednesday. Other types of cherry blossom trees, including the Kwanzans, are expected to be protected from the cold. They are projected to be in peak bloom from April 10 to 13. The closer the trees are to being in bloom, the more at risk of damage the blossoms are, said Park Service spokesman Mike Litterst. If the blossoms are still tight in buds, they're "hopefully" still protected. The cold may damage the flowers, but the trees themselves are expected to be fine. If you see a cherry blossom tree covered in ice, leave it alone. Shaking the branches to try to clear the snow and ice can cause damage, the National Park Service says. Officials will leave the trees alone, too. "Our policy is just to let nature take it's course," Litterst said. No matter what, the Tidal Basin should have some beautiful blossoms, Park Service horticulturist Michael Stachowicz said Wednesday. "There might be enough of these green buds that are still waiting to come out and enough other backups coming up that it's still going to be a pretty spectacular show," he said.